Have you ever heard that expression, to squirrel something away? The concept when you want to save something for later. A good example of this, my dog Lucas if given a raw hide, unlike most dogs, will not chew on it, instead he will hide it under a couch cushion — in other words, he likes to squirrel away his treats. I went away for a week and my spouse sent me an interesting picture from our porch. 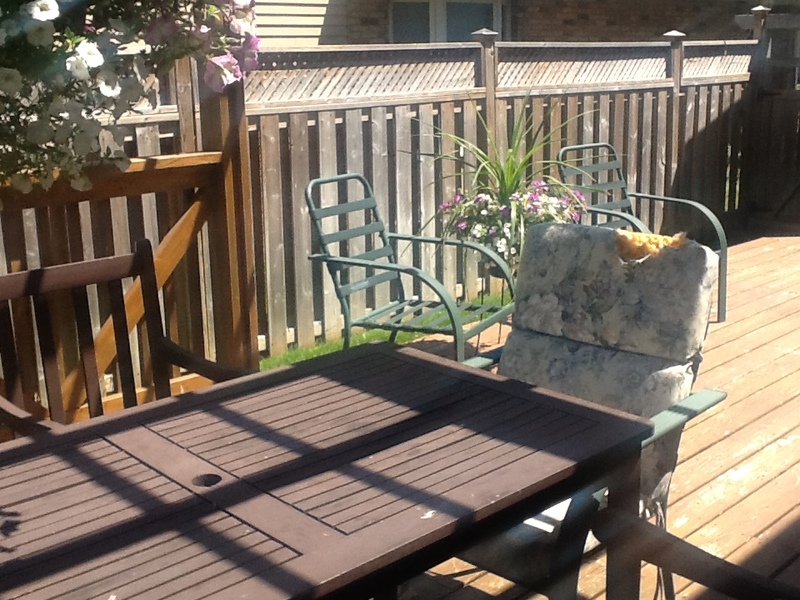 It appears some elusive creature in our back yard finds my patio cushions rather irresistible . At the beginning it was just a small nibble, a tiny hole. Over night the industrious little creature managed to gain some headway and make a mess. 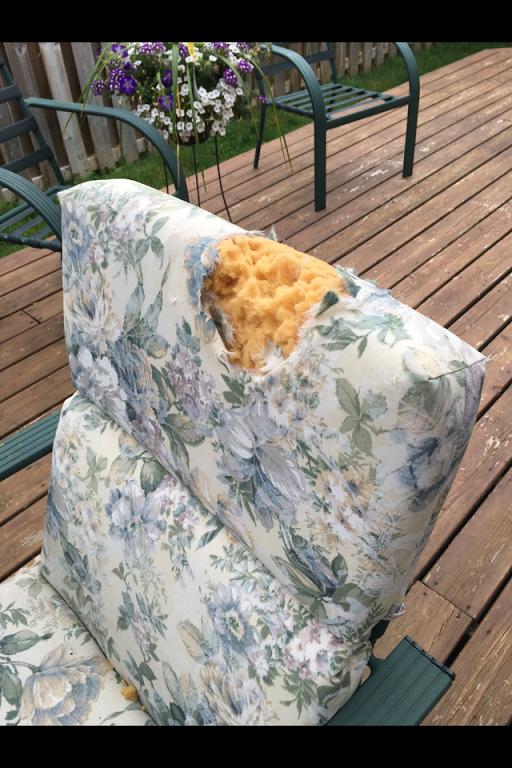 My family has been musing what animal might be ravaging our patio chairs, today it hit me, it’s our crazy backayrd squirrel! I do no have proof that this midnight foam marauder is in fact a squirrel, it could be a mouse or a raccoon, who knows, maybe some variety of bird. I am stuck on the idea that the culprit is this rather incorrigible black squirrel that likes to laze on the railing of the tree fort outside of my bedroom window and on the rare occasion has been known to hang off my screen. He clucks and taunts the cat and dog on a daily basis. One night we were in the kitchen, and the window there looks onto the roof, next thing I knew that saucy little guy was staring in the window at me. 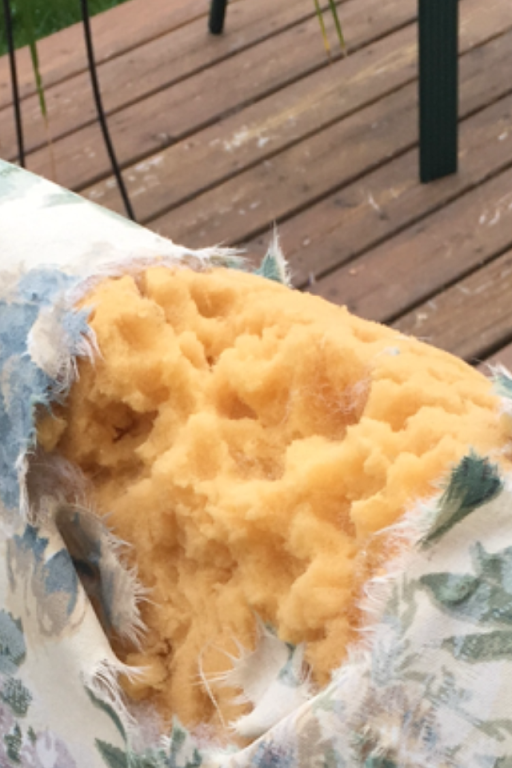 My guess is all that foam has gone towards making a wonderfully comfortable new bed , who cares if it makes my lounging area on the patio less attractive. Now that the damage is done I have decided to be neighbourly and leave things be, maybe he’s got a few friends who would like to add a little comfort to the place where they slumber. I won’t lie, I am still hoping to solve the mystery, it’s making me a bit nuts. As much as I am willing to sacrifice the dilapidated cushion, the other five will stay safely stowed in the garage, lest the varmint decides to expand it’s horizons.